Ominski feigning an impending trampling in front of his painting "The Rowena Incident"
Overrun	- Ominski feigning an impending trampling in front of his painting "The Rowena Incident"
Born in 1952 in Portland Oregon. Resides with his wife, Librarian Mary Finnegan, and Lewis and Clark (the Siamese cats) in Rhododendron, Oregon. Primarily self-taught, he began his professional career in the fine arts in 1970 with emphasis on intimate landscapes and other subjects from the natural world, rendered in a tightly representational style. Ominski works in the mediums of pencil drawing and/or watercolor (on paper) and acrylic or oils on panel or canvas. He has shown in numerous one man and group exhibitions in galleries and museums in Washington state, Oregon (and Kansas, but that’s another story) and has been included many times in Artist of Oregon exhibits at the Portland Art Museum - most recently he was selected for the Invitational Plein Air Paint Out (August 2012 and 2014). He has also been included in several of OSU’s Art about Agriculture exhibits and Seeing the Forest traveling exhibits. In another life Ominski wrote and illustrated (pen and ink drawings) a weekly nature column and provided freelance illustration for the Salem Statesman Journal (1984-1990). He was once featured in American Artist Magazine (April 1989). Over the last ten+ years he has created illustrations regarding the Missoula Ice Age Floods that have been included in numerous publications from the Oregonian to the New York Times. A traveling collection of his Ice Age Floods work (most recently on display at The Dalles Discovery Center) has exhibited at the U of O Museum of Natural and Cultural History (Eugene) and the Columbia River Exhibition of History Science and Technology in Richland, Washington. Ominski is included in various private collections and has enjoyed corporate patronage from Louisiana Pacific Corp. Working in larger format, he began focusing on corporate commission in 1985 producing work for the likes of A. C. Gilbert House Discovery Village (Salem), the Salem Public Library, Salem Cardiology Associates, Acordia Insurance Co. and Samaritan Albany General Hospital. Recently finished: a series of fine art/interpretive work on the Missoula Ice Age Floods for the Washington State Parks system, and a series of work regarding the Willamette Meteorite, for the City of West Linn. 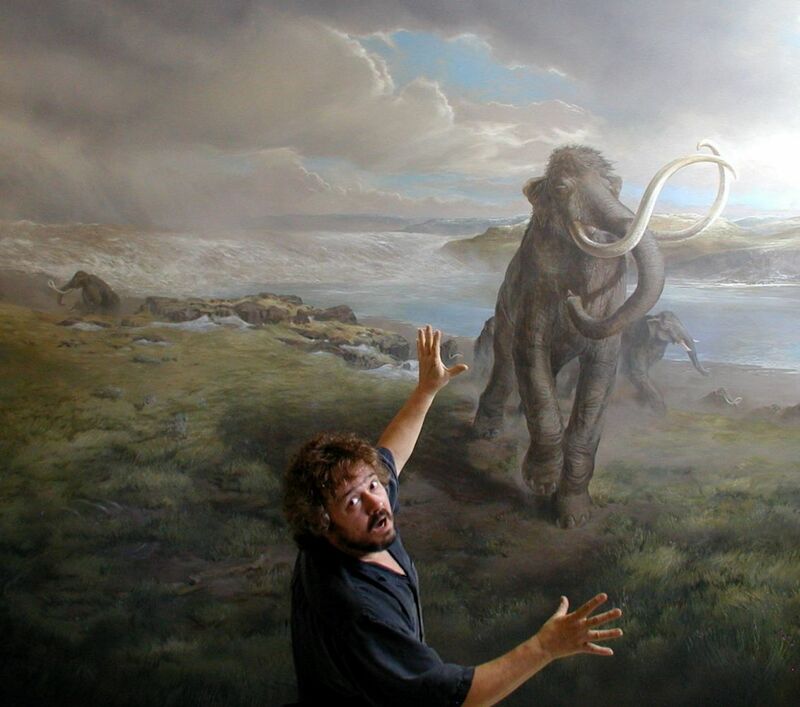 A 10’ x 9.5’ canvas depicting the Ice Age Floods in The Dalles area, was commissioned in 2008 for the permanent collection of The Columbia Gorge Discovery Center. Currently, Ominski is working on an extensive personal exploration of the living waters (and a few interesting characters) of the Cascades. Of note a tribute to a late friend and Mt. Hood icon, logger, Tom Rutledge, shown in February and March 2013 in Welches, Oregon. 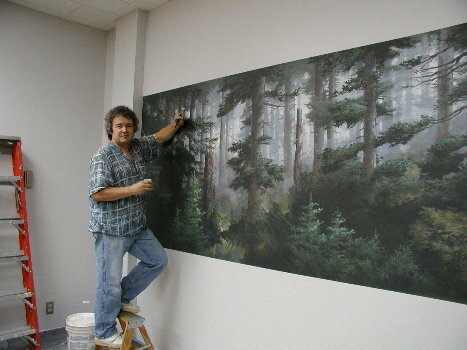 Like most of Stev's mural work, the Albany Hospital Forest Mural was produced in the Artist's Studio on canvas. Later the canvas is trimmed to it's final size and hung like traditional wallpaper. Further details are added or strengthened on site as required during installation.